- We are participating in Bakutel for the second time. This year we are actively demonstrating new Mac equipment for visitors to our stand. 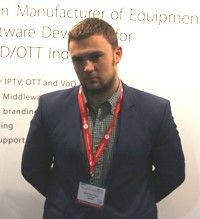 We present information about the next-generation Mac 254 and Mac 260 adaptors, created on the Android platform, as well as the Mac 275 adaptor with the DVB-T module. In addition, we are offering the Mac 250 which is currently the most popular adaptor. Last year at Bakutel we offered adaptors based on the A10 chipset; this year they are based on the А20 chipset. We want to demonstrate our hybrid solutions that meet today’s requirements of the global market. We are talking about hybrid technology such as IP TV, and DVB-T, DVB-C and DVB-T2 modules. We are also raising the awareness of visitors to the exhibition, who are our potential clients, of our Magic Solution, which offers complex solutions. This technology, including the intermediate software, is completely free. In parallel to our promotion activities, we also want to communicate with our existing clients at the exhibition, as well as find new ones. Today we have planned to hold a number of meetings with integrators. Bakutel is a very productive exhibition and it is very interesting for us. We intend to participate in Bakutel again next year.